I hope all is well and that you had a great weekend. I’m Jonny come lately because I got sick before and after the festival, but all is well. Met some great people and looking forward to starting anew next month with ArtDify. Yes, this is my last post on this domain, thruhisvesseljb.com, but it won’t be my last post on my blog. No worries, I’m just moving to another site where the blog, artwork and art testimony parties would be easily accessed by you. The new website should be completed no later than next week. I want to thank every reader who has encouraged me throughout the way whether it is through a smile or comment. I’m not completely gone, I will still contribute as a guest blogger to the Isaiah 51 project , but those are buckets of water compared to the waterfall of content, I will post on ArtDify’s site. In addition, if you are a fellow artist, and a believer, I would love to feature you in my blog. Just email me at thruhisjb@artdify.com for more info. In addition, if you haven’t already , this is your last chance to subscribe to The Peephole newsletter before this blog shuts down for good on October 1, 2016. Above, Saturday, September 24, 2016. 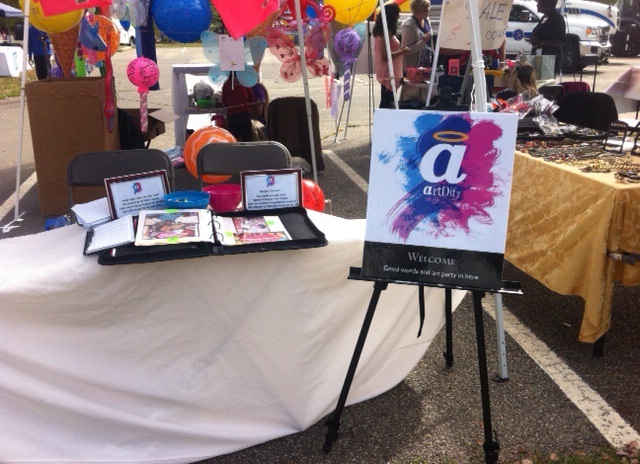 ArtDify ‘s booth in the flesh.